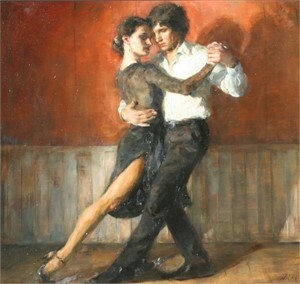 Ron Hicks' works have been characterized as a blend of representational art and impressionism. Some critics have compared them to paintings by Rembrandt and Daumier. The 41-year old artist translates his own moody visions with a muted palette and rarely uses pure color. He particularly favors the variety he finds in gray. "Gray allows me to capture atmosphere, mood, and layers of emotion," he says. "Gray sets the tone for the rest of the painting." Shelves in the artist's studio are lined with art books about Nicolai Fechin, James Whistler, and William Merritt Chase. There are also volumes featuring Hicks' main muses-John Singer Sargent, Edgar Degas, and Diego Velazquez. As an artist, his philosophy involves guiding the viewer though a painting, much like his artistic idols, by striking a balance between revealing too little and not enough detail. "It's a very delicate balance," Hicks says. It's no surprise that Ron Hicks spurns the academic approach to figure painting, which requires exactness-too stiff and boring, he says. It's also a method that can yield models with pained expressions. His creative process involves explaining an idea for a pose to a model and then waiting for her to strike a comfortable facsimile. "The best postures are the ones that just happen; then the models stay comfortable," he says. "I don't want to paint a pose that is unnatural and has nothing to do with actual life." If one asks Hicks about his favorite subject matter he replies without hesitation, "figures and interiors." But he quickly qualifies "figures" by saying that painting them is really about painting shapes of color. "I am a shape guy. By that I mean I see things more in terms of shape rather than the objects or people," he says. "Everything is about shape, medium shape vs. large shape, lighter shape vs. darker shape." Hicks has been interested in art since he was 4 years old and growing up in Columbus, Ohio. His mother pursued art as a hobby and took correspondence courses. The young Hicks would scan the critiques of his mother's works and then trace some of the assignments himself. As his talents became known in his neighborhood, he was called on to draw things for community events. In high school, he learned how to use his skills as a weapon. After high school, Hicks attended classes at the Columbus College of Art and Design on scholarship. He eventually moved west where he graduated from the Colorado Institute of Art and studied at the Art Students League there. Today he credits his teacher with exposing him to a new way of seeing. "A light bulb was turned on. I started seeing things in terms of shapes and edges, texture, line and color," he says. "I no longer saw painting as a way of just transferring information; I started looking at what I wanted to say in a piece." After graduating from college, Hicks worked for a time as a freelance illustrator. He also worked as a manager for a satellite dish company while he painted at night. "Maybe it's three years of night painting that gave me my subtle palette," he says half-jokingly. Now Hicks paints full time with every show he creates selling out. His goal is to travel around the world and spend enough time gaining a deeper understanding of the people of the counties he visits. "If you are not moving, evolving and solving problems as a painter, you are dead. I don't want to be one of those artists that says, ‘This is a nice flower painting. Now let me do it again and again.'" Hicks says. "My goal is to keep my work as fresh and new as possible."